The least well known of the three Chevrolet brothers, Arthur competed in two Indianapolis 500s, in 1911 and 1916. 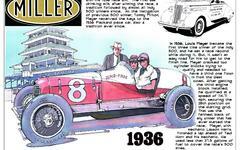 He also raced at the Indianapolis Motor Speedway prior to the first Indianapolis 500 and came away with a fourth-place finish in the May 1910 Wheeler-Schebler Trophy, a 200-mile contest. Arthur's mechanical skill rivaled his elder brother Louis, who, despite baby brother Gaston's 1920 Indianapolis 500 victory, is generally recognized as the most skilled driver in the family. Louis was a mechanical genius, but none of the brothers proved successful in business. Louis and Art ended up in a bitter argument - too typical of the eldest sibling in his business partnerships. They parted ways and their lives declined to sad ends. Louis' health deteriorated and he passed away in 1941 after an operation to amputate one of his legs. Art committed suicide at his final home in Louisiana in 1946. Gaston was killed racing only months after his Indianapolis 500 victory. Louis and Art lived their final years virtually penniless.